For over 25 years, Viviscal users in over 25 countries have stopped their thinning hair and enjoyed stronger, healthier hair. Now you can, too! Doctor-recommended, 100% safe, all natural, drug-free Viviscal hair nutrient tablets are clinically proven to support and maintain natural hair growth from the inside out. Containing the exclusive AminoMar C™ Marine Complex from Scandinavia, Viviscal hair vitamins nourish hair and scalp to encourage growth of existing hair and help “restart” dormant hair follicles. * Hair is visibly stronger, thicker, more vibrant in as little as two months. 60 hair nutrient tablets (1-month supply). Persons allergic to seafood/shellfish should not use this product. AminoMar® Marine Complex, Horsetail (stem) Extract, Millet Seed Extract, Vitamin C (from Acerola Cherry and as Ascorbic Acid), Niacin (as Niacinamide), Biotin, Iron (from Ferrous Fumarate), Zinc (from Zinc Oxide). Other ingredients: Microcrystalline Cellulose, Maltodextrin, Hydroxypropyl Cellulose, Glycerol, Croscarmellose Sodium, Magnesium Stearate, Natural Orange Flavor, Methyl Cellulose, Silicon Dioxide and Glycerin. Contains Fish Ingredients (shark). Take 2 tablets daily for a minimum of 3-6 months (1 in the morning and 1 in the evening) taken with water after food. I have high blood pressure and I am a diabetic and my meds were thinning my hair. Viviscal tablets has shown me new hair growth and my beautician certainly noticed! Great product! Great hair growth product! So happy I bought it. I will keep using this for a while!! Very pleased! A product worth spending the money on. Since using this product, not only did I notice a change in a two week period in the growth and hardening of my nails but I also notice a significant change in the loss of hair strands. I will always take this supplement. 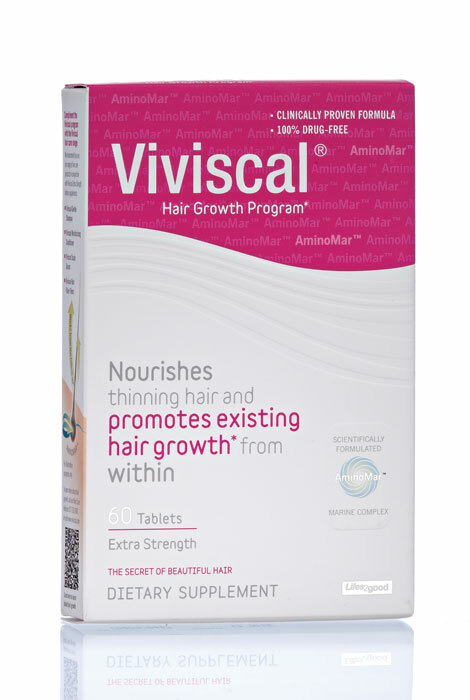 Viviscal has come to my rescue after experiencing thinning hair after several cancer surgeries. This really works! I just started my third month and my hair went from thin, limp, and not growing at all to really full, shinny and growing fast. it really gets your hair healthy and growing again! I've only been taking this for not quite a month and I can already see and feel results! I have stubbles of new hair all over my head and my hair feels and looks great. I started this because I was loosing hair and now I don't have to worry, I know that Viviscal is already reversing the process!! I've looked at so many products to solve this problem and I'm already confident that I'm using the right one! Thank you, thank you!! I use this product regularly to keep the thin spot on top of my head filled out. It works so well I have become dependent on its use. I have no complaints keeping my appearance up to my husband's expectations. It Does What it Says it will but you need to be be patient and do it more than 1 month! I've been looking for this product! Thanks for offering it! Although I typically forget to take daily products, it seems that this one does work over time. Anything that would help to naturally treat aging is a plus! I have just started taking these nutrients. So I will have to give you a review at a later time. It is to early to see any results. I have hair thinning issues for the past couple of years and have tried many solutions both tablet and topical...trying this since good reviews...we'll see. I tried this product before and was getting results after one month. Its a little expensive, but I would like to try it again. I would like to try to improve my fine hair from the inside out. Thinning hair. Didn't help at all and I used it as instructed over time. Haven't purchased again. I am on my second month and it seems to be working. I also gave my daughter a box to try and she agrees its working. I have thinning hair and have read about this product, so I want to give it a try. My hair was thinning due the amount of relaxers being used in my hair. I decided to give this product a try and I"m so glad I did. I was pleasantly surprised. My hair is as thick now as it was in high school and that's been a good while ago. Awesome product will continue to use this product as long as it is available.Thank a million!!!!! I have tried this product before and it seems to work, so I decided to order more and try it longer to see what happens. Helps my hair loss. I loose less each day. I am loosing to much hair. I will trust in your product to restore volume, and stop shedding. I have used this in the past and then I could not find it in a store. Then I saw it advertised on TV I was glad to find it. The reason I wanted to find it, is because it WORKES! help my hair grow. I had folliculitis and I thought my hair will never grow back I stared drinking Viviscal and saw the result. I've used this before & it works! It works and a good price! I'm losing hair and I haven't tried this yet. the reviews sold me. Been using other topical products with unimpressive results. It's just great. Your hair looks so natural with this wonderful product. My hair is thinning & I thought that this might help. Also, in my catalog the sale price for this product was noted as $38; according to my order I was charged full price. I was using WEN and I have loss a lot of hair. Is this product for the hair on your head only? BEST ANSWER: I've had very good results for thickening the hair on my head. I've not noticed hair change anywhere else on my body. Note though that it takes somewhere between six months and a year to see results. Thank you for your question. 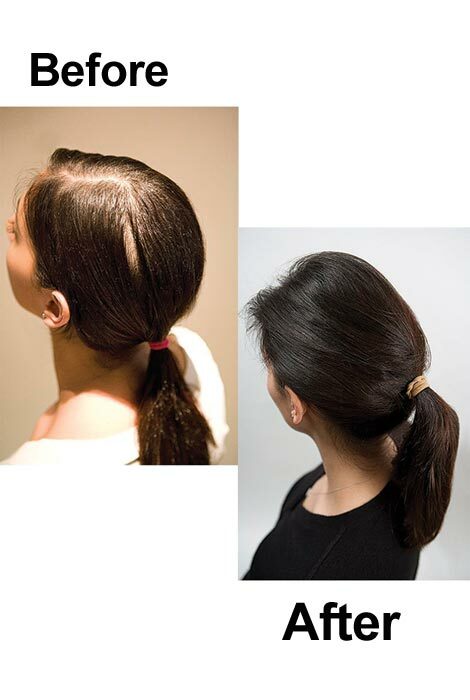 Is designed to help nourish hair growth on the scalp and has been tested for scalp hair growth. I hope this information is helpful for you. if you stop useing this product will your fall out again viviscal tablets? i found kerinique a poor choice Are you saying this one is better? BEST ANSWER: Absolutely!! The results are as different as day and night! It has been amazing for me. My hair would not grow and Ii was getting bare spots! It filled everything in and now my hair is longer than mid back! That took about a year from just under my ear. But it started filling in the first month, by 4 months I could really see the difference! I've turned so many of my friends on to Viviscal and it's worked for everyone! Go for it, you won't be disappointed!!! These tablets have really helped my hair come back. About 2 years ago I went on a diet and I lost a significant amount of hair. It was very noticeable. I started taking these and my hair is back just like it was before. Yes it is no fishie smell. Does this work on age related hair loss? BEST ANSWER: Absolutely, I'm 67 and it filled everything in for me and gave me thick hair. Everywhere I go I get complements on my hair!! I am 79 years and it has helped my hair considerably. It is like It was 20 years ago.